Hi. Welcome to STYLE SCOUT with Bri Holloway. I'm your host Bri and I'm always looking for a sophisticated twist on the trend. First the trend this week is WILD FUR! I don't know if it's the popularity of Game of Thrones or what but the fur that's hot this season isn't the Queen's fur. It's wild, opulent, bright and shocking. 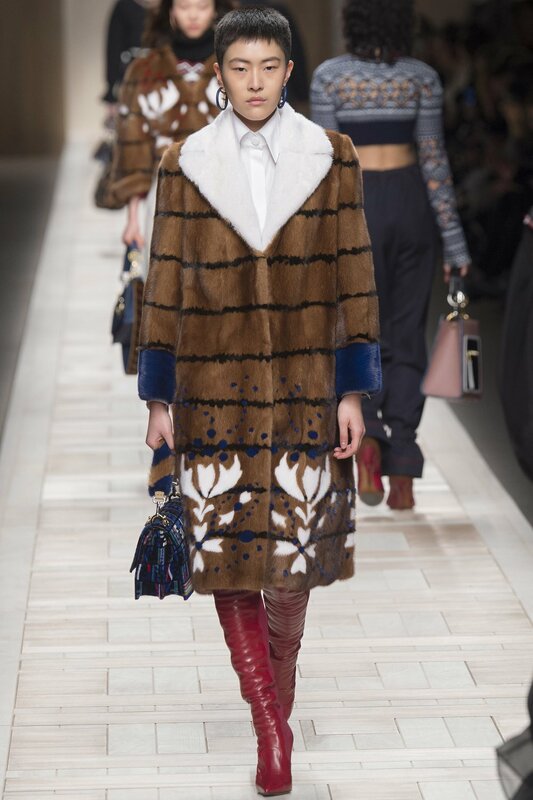 Fendi, known for their luxUrious fur, showcased fur coats in a array of line leaf-motif patterns and branded symbols. Roberto Cavali featured shearling in a spectrum of cream colors. So what's the sophisticated twist on the trend? The coat, vest, jacket whatever you are wearing is a statement in itself. I recommend pairing a wild fur with cigarette leggings to keep the focus on the coat. If you're opting for an evening look keep the dress lines clean so not to overwhelm the proportions of the fur. Here, I've combined an Utzon sky blue mink with cigarette denim for a fun easy pulled together day look. For evening I chose this UTZON chevron fox vest with a suede sheath you can wear to any fall event. Thanks for joining me on STYLE SCOUT and until next time I'm Bri Holloway. I'm always looking for a sophisticated twist on the trend.